Feedback from the large number of attendees who visited PrismTech booth at the first annual IoT Solutions World Congress that has just ended was that the event had been a big success. 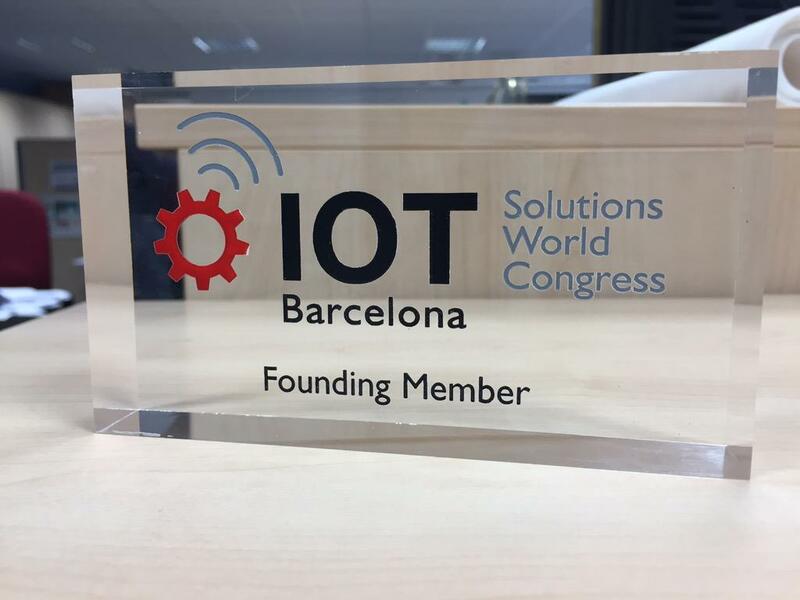 Held in Fira, Barcelona, Spain and in partnership with the Industrial Internet Consortium (IIC) the congress brings the world’s IoT players together to showcase the Internet of Things’ market. Attended by over 4000 international IoT decision makers, with 120 speakers and 83 sessions spread across 6 different congress tracks, this year’s congress theme “Putting IoT to work” highlighted hot topics such as government’s role in IoT, collaboration and partnership models and dealing with start-ups amongst businesses. At the same time core issues such as security, interoperability, big data management, insights and analytics; and mobility remained the focus of many discussions. Many attendees enjoyed exploring excellent exhibits such as Intel’s Automated Smart Greenhouse, Vodafone’s Connected Car, Carriots’ Lego Smart City and NEC’s Face/Age detection technology to name but a few. PrismTech announced its Vortex Innovator Program (VIP) on the first day of the congress. The VIP provides access to Vortex Products to qualifying IoT startup companies with innovative new ideas, by removing any up front licensing costs and helping them to kick-start their IoT journey. On the final day of the event, PrismTech CTO, Angelo Corsaro presented to the main conference on subject of “Smart, Secure and Efficient Data-Sharing in IoT”. The presentation was very well received and discussed the many capabilities of DDS fundamental to efficient real-time data sharing in IoT systems. 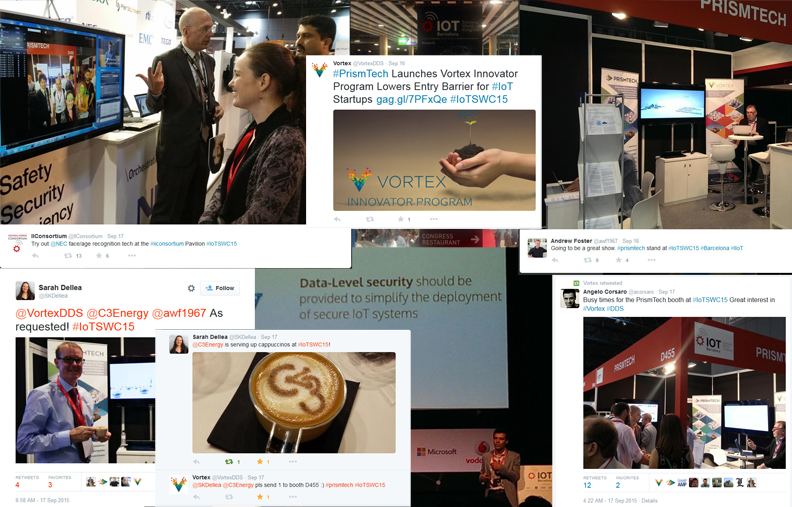 With a great atmosphere throughout the 3-day event, the feedback that PrismTech received from delegates, speakers and exhibitors alike was that the IoT SWC conference had been a massive success, roll on IOTSWC 2016. For OEMs and system vendors the focus of the IoT will often be on enabling new products, new services, and an enhanced customer experience. The ability to generate in-operation data from products, access and analyze them remotely (by other devices, a Smartphone app, by a cloud service, etc. ), and generate new insights into product performance, integrity, energy consumption, utilization, etc. gives vendors the ability to more closely align their offerings with their customers’ business needs and add new services (and thus new revenues) to their portfolio. The IoT can thus revolutionize the way a required business solution is delivered and dramatically increase user-friendliness, interoperability and the efficiency of post-sales customer service. At PrismTech we see many OEMs moving quickly from offering stand-alone products to selling connected systems and the valuable data they generate and services they enable. The quest for sustainable competitive advantage (and fear of falling behind) will fund OEM investment in the IoT and provide the RoI projections that executives require to fund new product and system development. One such example is in power generation and distribution. In 2013 US utility giant Duke Energy formed the “Coalition of the Willing” (COW), a consortium of grid technology vendors focused on the promotion and adoption of an Open Architecture approach to standardizing the way grid-edge technologies are integrating together. 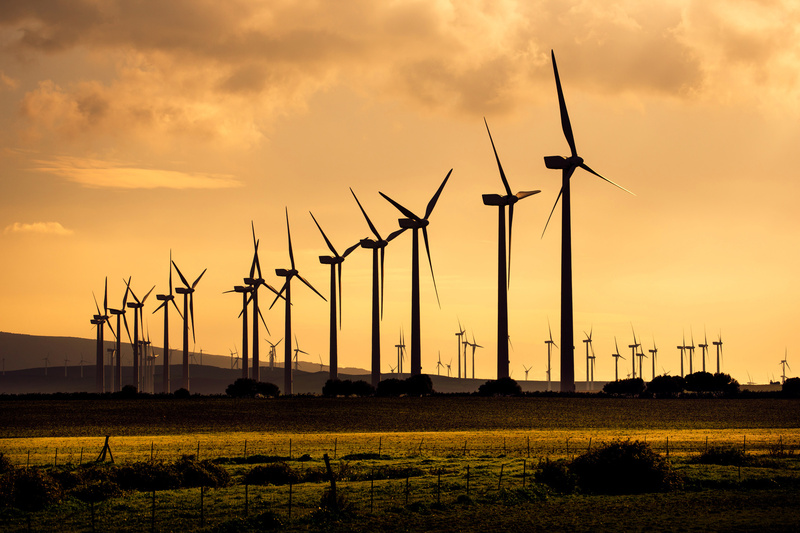 After successfully demonstrating in real-time how different grid devices could talk to each other and reducing the feedback control process from minutes to less than 10 seconds, the energy industry has really started to take notice. This work is also helping address the key issue of intermittent availability of supply when deploying renewables as part of an integrated generation system. Thus users and device OEMs are collaborating and using the IIoT to unlock new value from device data generation, connectivity and interoperability. From products to systems. For End Users the focus will often be on operational efficiency and the potential for significant productivity gains and cost reduction. With operational assets (devices, machines, people, buildings, street furniture, etc.) producing more real-time data… and new apps, analytics and interoperability providing the ability to convert them into actionable insights and superior coordination, the scope for operational gains of many percentage points has been identified in industries as diverse as manufacturing, energy, transportation, healthcare, cities and critical infrastructure. Projected savings driven by superior energy efficiency, resource utilization, staff deployment, capital asset longevity and reduced cycle times will fund End User investment in the IoT and provide the RoI projections that executives require. Already the City of Nice and its residents are seeing real benefits from improved city mobility. By having real-time access to car park space availability data via mobile devices, drivers are taking much less time to park and parking income from reduced fraud is up by 35%. This in turn is helping improve traffic flow and has reduced congestion by 30%. Air pollution and noise levels have been reduced by 25%. In the future, better city management will see savings of between 20-80% in areas such as street lighting and waste management while improving overall environmental quality. Known as the capital of the French Riviera, the city of Nice, France, is many things. It’s beautiful, it’s cosmopolitan and it’s vibrant. But it’s also something else — it’s possibly the smartest city in the world. Among spectacular panoramic views, the rich culture, and all the shopping and nightlife opportunities is an underlying connectivity. It’s actually an intelligent data-sharing infrastructure that is enhancing the city’s management capabilities and is making daily life more efficient, enjoyable and easier for the more than 300,000 residents that call Nice home and the more than 10 million tourists who visit each year. It’s what makes this city smart… really smart. Nice has been gaining much attention lately thanks to a series of innovative projects aimed at preserving the surrounding environment and enhancing quality of life through creative use of technology. Connected Boulevard is a great example of this. The city launched the Connected Boulevard — an open and extensible smart city platform — as a way to continue to attract visitors while maintaining a high quality of life for its citizens. 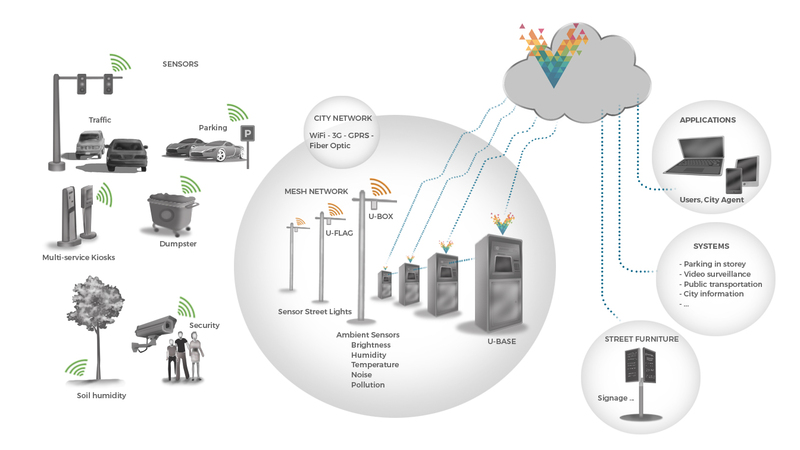 Connected Boulevard is used to manage and optimize all aspects of city management, including parking and traffic, street lighting, waste disposal and environmental quality. A number of companies played a key role in the launch of Connected Boulevard, including Industrial Internet Consortium members Cisco, which is providing its Wi-Fi network, and PrismTech, which is providing its intelligent data-sharing platform, Vortex (based on the Object Management Group’s Data Distribution Service standard) at the core of the Connected Boulevard environment for making relevant data ubiquitously available. Think Global, an alliance of innovative start-ups and large companies, designed the Connected Boulevard architecture with an eye toward maximizing extensibility and minimizing maintenance costs. In a smart city environment, the main costs typically come from system maintenance, rather than initial development and launch efforts. A big part of these maintenance costs come from the replacement of sensor batteries. To help reduce these operating costs and maximize battery life, the Connected Boulevard project team made an interesting and forward thinking move — one which was in direct contrast with some of the latest thinking by those in the smart device and edge computing community. Connected Boulevard relies on “dumb” sensors. These sensors typically are simply measuring physical properties such as temperature and humidity, magnetic field intensity, and luminosity. Once collected, these measurements are sent to signal processing algorithms within a cloud, where the data is then “understood” and acted upon. In the Connected Boulevard, magnetic field variation is used to detect parked cars, temperature and humidity levels are used to determine when to activate sprinklers, luminosity and motion detection are used to control street lighting. The sensors in the Connected Boulevard rely on low power protocols to communicate with aggregators that are installed throughout the road network. Powered by the power line, the aggregators use Vortex to convoy the data into an Amazon EC2 cloud. The data is than analyzed by a series of analytics functions based on the Esper CEP platform. Finally, relevant information, statistics and insight gained through the data analysis are made available wherever it is needed within this connected ecosystem. 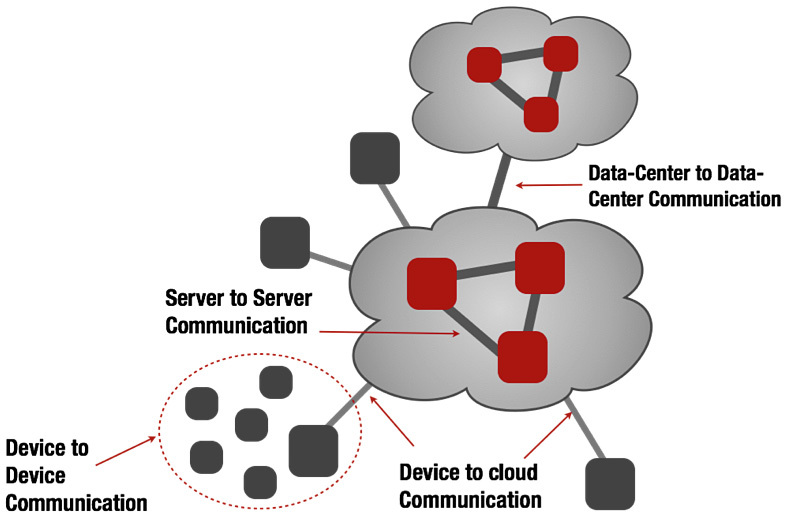 The applications within Connected Boulevard use caching features to maintain in-memory, a window of data over which real-time analytics are performed. The results of these analytics can be shared with applications throughout the overall system, where decisions are then made, such as what actions should take place. For example, the Nice City Pass application checks for free parking places and can also be used to reserve them. If a car is occupying a parking space that the driver has not paid for, a notification is sent to the police to ensure that the violating driver is fined. After the initial installation of Connected Boulevard a few years ago, traffic congestion was reduced by 30 percent, parking incomes increased by 35 percent and air pollution has been reduced by 25 percent. It’s also anticipated that savings on street lighting will be at least 20 percent, but possibly as high as 80 percent. These are real, tangible results… and are clear examples of a smart city at work. Boston, MA, USA – April 12, 2013 – PrismTech™, a global leader in standards-based, performance-critical middleware, today announced that its OpenSplice™ DDS product suite has been selected by SUDE as the foundation to implement The City Operating System project providing the City of Nice with new intelligence to coordinate and connect all of the parking services and mobility in the City. SUDE specializes in the management of urban space and mobility for the City of Nice. SUDE focuses on the implementation of Think Global – The City Operating System®, an ecosystem that aims to improve the efficiency of city services. Smart systems add value to citizens by providing real-time information on traffic, transportation, wastage, air/water quality etc. countering the problems faced by cities due to rising population and urbanization. PrismTech’s OpenSplice DDS has been selected as the information backbone for this City Operating System project, to ensure Intelligent Mobility and Environmental Quality in the City of Nice. Smart Parking systems allow drivers to make informed decisions on their movement by combining traffic information and parking availability (on street and garage), as well as alternative transportation (public transportation, bicycle sharing and electric car services). Smart Parking increases parking efficiency, safety, and reduces pollution. OpenSplice DDS has been deployed throughout the city and has shown its ability to scale extremely well delivering the right information to the right place at the right time every time. OpenSplice DDS enables sharing of real-time information about parking availability, and traffic density. OpenSplice DDS powered sensors inform commuters in real-time about the availability of a parking space, and re-routes traffic alleviating congestion along with facilitating the information through smart phones. A detailed Smart Cities use case is available from PrismTech’s website at http://www.prismtech.com/vortex/industry-solutions. “Helping to solve mass urbanization challenges is one of the most socially important, impactful and exciting uses of OpenSplice DDS that I have seen. PrismTech is thrilled to be part of this pioneering project in the City of Nice and looks forward to the adoption of The City Operating System in other great cities,” said Andrew Lloyd, OpenSplice SVP, PrismTech. “The OpenSplice DDS middleware layer fits perfectly well with the SUDE vision: a global answer to the multi-facetted challenges of the management of urban space,” said Jean-Louis Fiorucci, President, SUDE. Further information about OpenSplice DDS is available from PrismTech’s website at: http://www.prismtech.com/vortex/vortex-opensplice.